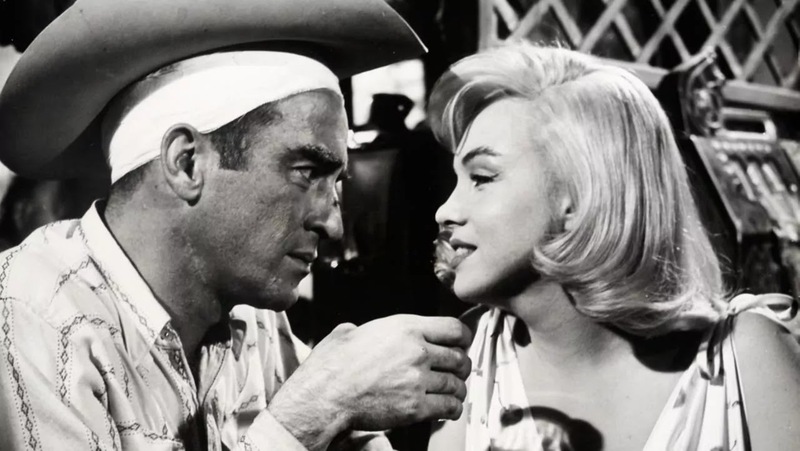 The quality of John Huston's 1961 drama The Misfits is often eclipsed by its salacious backstory. The final completed film of both Clark Gable and Marilyn Monroe, it was written for Monroe by her then-husband Arthur Miller while they were in the grip of a divorce. 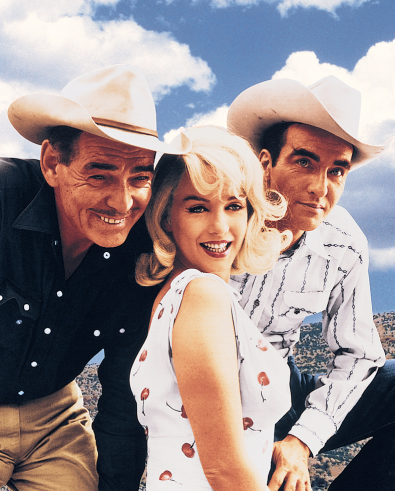 Shooting was difficult, as both Marilyn and co-star Montgomery Clift suffered from various addictions and mental afflictions. Both Huston and Gable were hard drinkers themselves, but their habits were nothing compared to their younger cohorts. 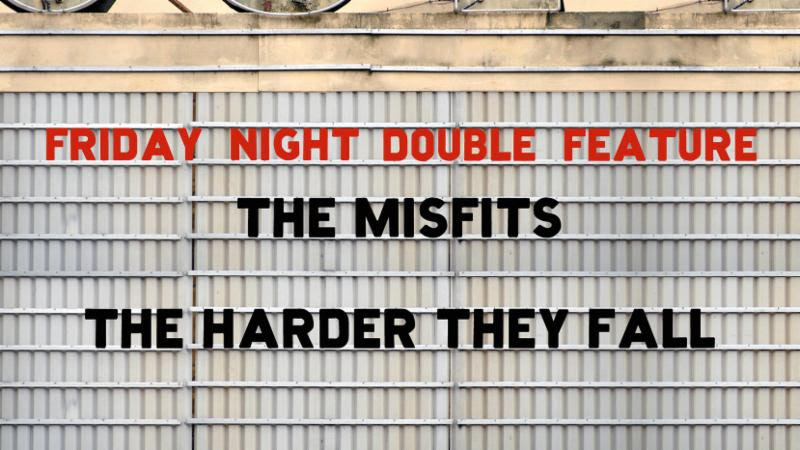 The Misfits even fell into hot water with the studio, who couldn't make heads or tails of the film. If not for Gable, who had final script approval, standing his ground, who knows how the movie might have ended up. As it stands, The Misfits is a marvelous motion picture, easily one of Huston's best (not an inconsiderable boast). 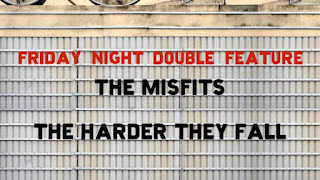 If it was misunderstood in its time, it's because The Misfits was a couple of years ahead of the curve. Its tale of displaced loners looking for meaning in the Nevada desert grappled with the passing of time--and not in the sense of a ticking clock, but historically. These characters represented an age that was ending, a lifestyle that was fading. It was as much a metaphor for the oncoming demise of Old Hollywood as it was the disappearance of 1950s America. The aura of freedom the characters longed for, and the artistic license that Miller and Huston were grasping at, were just around the corner. In two years, Martin Ritt's Hud would be a big hit. Maybe existential cowboys were just easier to take when they were Paul Newman, or maybe 24 months really did make that much of a difference. 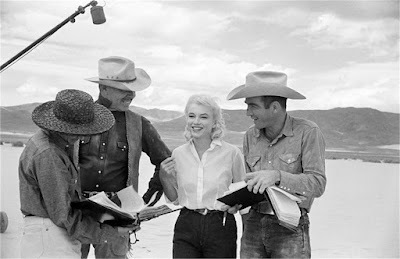 The Misfits opens in Reno on the day when Roslyn (Monroe) is going to court to finalize her divorce. Back then, Reno had the easiest divorce laws in the country, and wronged spouses moved to the littlest big city temporarily to establish residency and dissolve their union. (This was perhaps most famously portrayed in Cukor's 1939 production of The Women.) Getting her single life back likely paid off in terms of alimony, but it costs an emotional price for Roslyn, as well. Now that she's alone, she doesn't know what to do with herself. Enter a cowboy. Gay Langland (Gable) is a rootless roughneck who has a way with the ladies. In his mind, the worst thing in the world is "wages"--that is, a regular job. 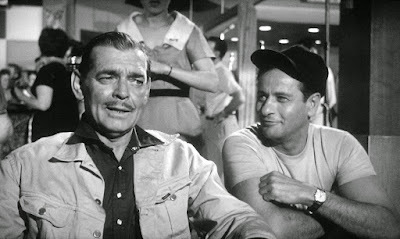 When Gay meets Roslyn, he's looking to bug out of town and spend some time in the wild with his pal Guido (Eli Wallach), a war veteran and pilot. Guido actually saw Roslyn first, he met her and the woman she's staying with (the great Thelma Ritter) that morning to assess the value of Roslyn's car. That Gay moves in on the curvy blonde causes Guido much consternation. Both men have refused to settle down again since their last marriage--Gay is divorced, Guido a widower--but Roslyn has a way of inspiring men to make exceptions to their principles. The quartet heads out to Guido's house on the outskirts of town, where they get loaded and flirty. Guido may know how to dance, but Gay wins the day, and Roslyn and he start shacking up at Guido's house. This is essentially Act I. Act II is hitting the rodeo to find a third cowboy to go mustanging. That is when they pick up Perce (Clift), another drunk who rides broncos and bulls. There is some intimation that he maybe has some mental problems, too, though which symptoms are caused by the booze and which by the blows to his skull are up to interpretation. Perce and Roslyn are immediately attracted to one another. If Gay is a kind of stable father figure, then Perce is a kindred spirit, a broken creature just like her. Seeing him tossed around a rodeo ring puts Roslyn on edge. She can't stand a living thing to be hurt. Earlier in the film, she even stops Gay from killing a rabbit who is stealing the lettuce from their garden. Act III is the mustanging. Roslyn goes with the boys, thinking that they intend to capture the wild horses for riding. This is not the case. Nevada mustangs are rounded up for dog food. Once upon a time, there were thousands of them in the mountains, now the men head out there believing they will find at least fifteen; the actual count is less than half that, calling attention to how pathetic this whole scheme really is. Roslyn, of course, is horrified, and her reaction stokes the testosterone in the group. There is much male posturing. First, it's who will abandon the deadly quest fastest in order to placate her; then, as she rejects different members of the hunting party, who is the bigger man. Gay almost literally wrestles with a horse just to prove no one can tell him what to do. In the frontier days, he might have been applauded for this macho showing off. In the context of The Misfits, you end up sad for him--even if you aren't sure which way your pity should flow. Is it because he is so out of touch with the times, or because the times are so out of touch with him? Arthur Miller's script for The Misfits is poetic and intelligent. The playwright never condescends to these characters; on the contrary, the writing shows tremendous affection for them. It would have been easy to make them purely comical, but the humorous moments come naturally, they aren't forced or born of ridicule. (The drunk antics when they all return home after the rodeo are as hysterical as the preceding scenes are heartbreaking.) There is a layer of metafiction here that is hard to avoid: these freaks getting boozed up and tearing each other apart out in the middle of nowhere really were a bunch of freaks in real life. The doomed history that follows The Misfits around--Gable died mere days after shooting was completed, Monroe followed within a year, and Clift apparently had his heart attack not long after refusing to watch the film on television in 1966--becomes part and parcel with the narrative. These were cinematic icons whose time was about to pass, working in a genre that had also seen better days. It's possible this is the first revisionist western, leading to the reassessment of the cowboy mythology that would redefine the genre over the next couple of decades. 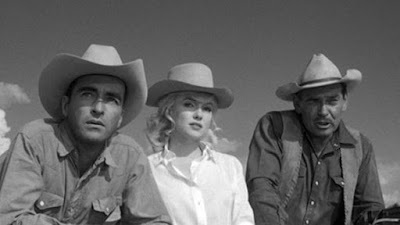 It's a safe bet that Peter Bogdanovich saw The Misfits before he started making The Last Picture Show [review]. John Huston's pioneering cinema style is all over that later film. Huston shoots in the thick of the action; wherever the dust is getting kicked up, he goes. Russell Metty's black-and-white photography is beautiful and gritty, capturing the open spaces of the desert plains and contrasting them with the cramped spaces where humans wall themselves in. The bar scene where Roslyn entertains the cowboys in inadvertent ways while playing with the paddle and ball is marvelously orchestrated; the men are climbing on top of one another, and the camera jockies for such positions, as well. Just as it's easy to forget the excellence of the scripted drama under the scandal of the off-screen drama, it's also easy to forget that these actors became stars for a reason. The acting here is exceptional, with Marilyn Monroe turning in one of her finest performances as the bruised beauty Roslyn. There is a wonderful scene in The Misfits when Gay comments on how sad Roslyn is, and she is shocked, most men always tell her how happy she seems. He replies, "That's because you make a man feel happy." 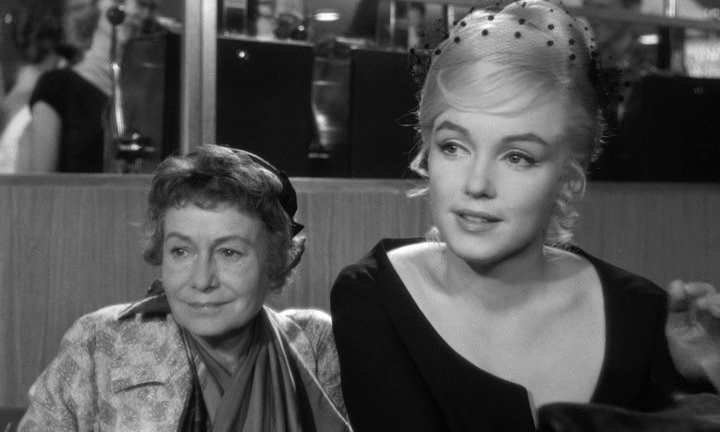 This one exchange could sum up the whole of Monroe's career, and to her credit, she brings this schism to life in her performance as Roslyn. She creates a complete character, one whose internal sorrow keeps her from ever being subsumed by the things the men in her life project on her. She can play at being happy, but Monroe knows how to do it so that it's clear that it's just for show. By the shooting of The Misfits, Marilyn had put in time with the Actors Studio. Montgomery Clift and Eli Wallach were also purveyors of method acting, and they both bring their naturalistic style to the production. They appear to be living it, not putting it on. (Clift has obviously been living it too much; his handsome features are starting to show signs of age and vice.) Clark Gable somehow manages not to get lost in this. His performance is pure confidence. Perhaps it's the fact that Gay is meant to loom large over the other men working in his favor. He is intended to be different, a misfit amidst the misfits, and so the performance styles end up meshing within the material. The Misfits is a heavy movie. It's a sad movie. It sets up multiple themes and contends with each, all the while giving proper showcase to the characters and their relationships. It's a movie that isn't afraid to be about something, but it never forgets to be about somebody--or a bunch of somebodies--along the way. It also doesn't skirt the surface or play with clichés; rather, Huston and Miller get right down in the human muck and root around in all the neuroses and foibles, and though they lament how their misfits are losing ground, they also show how these folks do it to themselves. The tide of history drowns those who can't adapt. The glimmer of hope here is that sometimes, when people swim for shore together, they actually find a way to stay afloat.